In Iowa, Josh Harry Isler, age 55, from St. Ansgar, Iowa, pled guilty in United States District Court in Cedar Rapids to one count of trade secret theft and one count of making a false statement or representation to the Federal Bureau of Investigation. As part of his guilty plea, Isler admitted that during August 2013, while employed with DuPont, but after having accepted an offer of employment from a competitor, he stole trade secrets of DuPont. 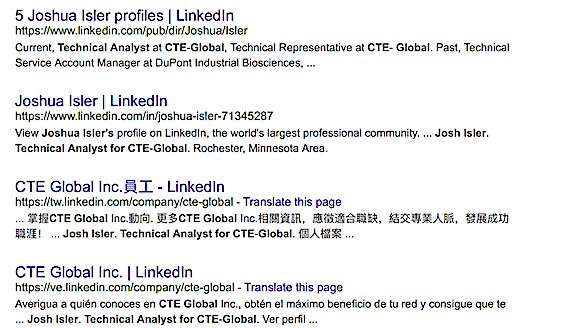 Although news reports did not identify the competitor, a “Josh Lister” has been previously listed as associated with CTE Global in Google-basedrecords of LinkedIn data, and previous to that associated with DuPont. CTE Global is active in the biofuels industry, but there is no active LinkedIn account associated with this person. In a plea agreement, Isler admitted that after he accepted employment with a competitor of DuPont in the ethanol fuel enzyme business, he transferred hundreds of DuPont’s electronic files to an external device. Isler knew the files he downloaded contained proprietary information and trade secrets of DuPont. Many of the files also related to DuPont customers who were also customers of the competitor or whose business the competitor was seeking. Isler kept the files in his new job and also transferred some to his new employer. Isler also admitted that when he was interviewed by the FBI in November 2013, he falsely denied he had downloaded files containing proprietary information.